Hachiyō Kōgaku Kōgyō K.K. (八陽光学工業㈱) or Hachiyo Optical Co. was a Japanese company known for making Alpenflex and Stereo Alpen cameras. The company had its origin in a fortified factory set up during the war by Nippon Kōgaku in Yamagata Prefecture (in the north of Japan's main island). In an advertisement for the Alpenflex I (or IS), Tanaka Shōkai makes explicit Hachiyo's origin as the Shiojiri (塩尻) factory of Nippon Kōgaku, and also uses Hachiyo's manufacture of microscopes as a sales point. The company went out of business in 1955. Hachiyō certainly also made the Orient II and Orient III shutters mounted on the Alpenflex. An Orient II shutter has also been observed on an example of the Rolex 35 III. ↑ Advertisement in the February 1953 issue of Nihon Camera, p.104. ↑ Kyōshū no burando ten, p.20. ↑ Advertisement dated 1954 reproduced in Shashin-Bako (75/3.5 only), and advertisement dated February 1955 reproduced in Kokusan kamera no rekishi, p.118 (75/3.5 and 50/3.5). Advertisement by Tanaka Shōkai. Nihon Camera (日本カメラ) February 1953. p.104. 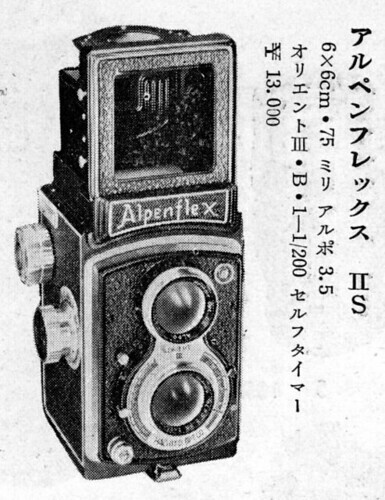 The advertisement is for an unspecified model of Alpenflex (apparently the I or IS and probably the former as a self-timer is not mentioned). Kanno Tsunetoshi (管野経敏). "Alpenflex." In Miryoku saihakken: Nigan refu: Firumu kamera ha e no messēji (魅力再発見・二眼レフ：フィルムカメラ派へのメッセージ, Fascination rediscovery: TLRs: A message to film cameras). Tokyo: Shashinkogyo Syuppansha, 2006. pp.118–9. Nihon no kamera o omoshiroku shita kyōshū no burando ten (日本のカメラを面白くした郷愁のブランド展, Exhibition of nostalgic brands that made Japanese cameras interesting). Tokyo: JCII Camera Museum, 1997. Exhibition catalogue. This page was last edited on 18 January 2019, at 19:05.